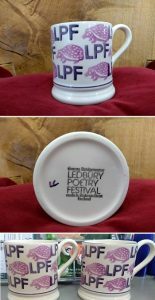 Special for 2018 – these earthenware mugs are a bespoke project by Emma Bridgewater especially for Ledbury Poetry Festival. They are completely unique and once they’re gone, there will be no more! We have only 100 to sell. Emma has worked closely with the Festival to create a design featuring this year’s festival animal, the hedgehog, and each mug has been hand-sponged. Selling for £18.00 including p&p in our online shop or £15.00 if bought in person at the Box Office (Mon, Tue, Thu, Fri: 10.00am to 4.00pm, Sat:10.00am to 1.00pm).